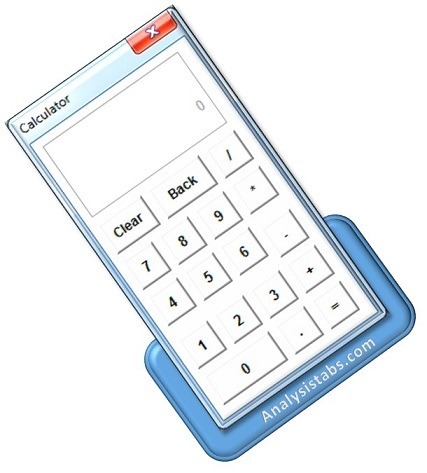 Calculator using Excel VBA UserForm - ANALYSISTABS - Innovating Awesome Tools for Data Analysis! Calculator using Excel VBA UserForm. Following is the step by step detailed explanation to automate this project using VBA. How we are doing calculations, clear the text, etc. To createc calculator, you can see the design of the userform in the section. Let me explain the key steps to develop this caculator project. We are going to write multiple procedure s for multiple controls with the below approach. Step 2: Place toolbox controls on the created userform: Place required controls on the userform. You can drag the controls from the toolbox and drop controls on the userform. Step 3: Set properties and alignment of all controls: Properties of each control has set. It is shown in the design section. Step 4: Clear Button: It is used to clear the display area. Step 5: Back Button : It is used to go back one digit. Step 6: Divide (/) Button: It is used for division. Step 7: Multiplcation (*) Button: It is used for multiplication. Step 8: Minus (-) Button: It is used for subtraction. Step 9: Add (+) Button: It is used for addition. Step 10: Dot (.) Button : It is used to add dot to the number. Step 11: One (1) Button: It is used to display number 1. Step 12: Two (2) Button: It is used to display number 2. Step 13: Three (3) Button: It is used to display number 3. Step 14: Four (4) Button: It is used to display number 4. Step 15: Five (5) Button: It is used to display number 5. Step 16: six (6) Button: It is used to display number 6. Step 17: Seven (7) Button: It is used to display number 7. Step 18: Eight (8) Button: It is used to display number 8. Step 19: Nine (9) Button: It is used to display number 9. Step 21: EqualTo (=) Button: It is used to perform all calculations like addition, substraction, multiplcation, etc . Step 22: Textbox: It is used to display result. This is what I used to create calculator design. By changing or setting all the above properties and values of control the form will be looking like below. Step 1: Create userform and do its initialization by double clicking on the userform and add the below code. In the above code we are setting maximum lenth of display numbers is 10. You can change this number. Step 2: Double click on the textbox (Value-txtRes) and add the following code. Double click on the ‘ Textbox’ and add the below code. In the above code we are displaying message when displaying numbers are exceeding 10. Step 3: Set properties as mentioned above and do the alignment of all controls as shown above in the screenshot. Step 4: Double click on the ‘Clear Button’ and add the below code. Step 5: Double click on the ‘ Back Button ‘ and add the below code. Step 6: Double click on the ‘ Divide (/) Button’ and add the below code. Step 7: Double click on the ‘ Multiplcation (*) Button’ and add the below code. Step 8: Double click on the ‘ Minus (-) Button’ and add the below code. Step 9: Double click on the ‘ Add (+) Button’ and add the below code. Step 10: Double click on the ‘ Dot (.) Button ‘ and add the below code. If txtRes <> 0 Then txtRes = txtRes + "." Step 11: Double click on the ‘ One (1) Button’ and add the below code. Step 12: Double click on the ‘ Two (2) Button’ and add the below code. Step 13: Double click on the ‘ Three (3) Button’ and add the below code. Step 14: Double click on the ‘ Four (4) Button’ and add the below code. Step 15: Double click on the ‘ Five (5) Button’ and add the below code. Step 16: Double click on the ‘ six (6) Button’ and add the below code. Step 17: Double click on the ‘ Seven (7) Button’ and add the below code. Step 18: Double click on the ‘ Eight (8) Button’ and add the below code. Step 19: Double click on the ‘ Nine (9) Button’ and add the below code. Step 20: Double click on the ‘ Zero (0) Button’ and add the below code. Step 21: Double click on the ‘ EqualTo (=) Button’ and add the below code. txtRes = "Cannot divide by Zero"
Please find the following procedures to create calender project. Please these procedures after creation of the design (as shown in the above) and right click on the userform select ciew code and place it. '2. To displaying message when exceeding more then 10 numbers on the To display area. '3. Settings properties of the userform. '5. To go back one step. '11. To display Number 1. '12. To display Number 2. '13. To display Number 3. '14. To display Number 4. '15. To display Number 5. '16. To display Number 6. '17. To display Number 7. '18. To display Number 8. '19. To display Number 9. '20. To display Number 0. Here are steps to display calculator on the userform. Right click on the shape, selct assign macro. select the shape name from the available list and click on OK button. Now, go back to the shape and click on the created shape to see the calculator on the userform. You can download the below file and see the code and execute it. Insert userform from the Insert menu. Create design as shown in theabove steps..
Add Procedures by double clicking on userform. Run the project by hitting F5 key from the keyboard. hit the numbers on the calculator and see the output on the display area. And als you can use keyboard keys(up, down, left, right and enter to display numbers. Here is the Excel macro workbook file to explore the calculator project yourself. what is txtres and txtdisplay variable in here?? txtDisplay is the main text box used to display the entering values, and the txtRes is the textbox used to display the Result. I love this project, please is there any how we can conmunicate cause there are some section where I got loss.